This is my favorite go-to recipe. Heat broiler with rack 4 inches from heat source. In a medium bowl, mix 1/4 cup onion, 2 teaspoons Italian seasoning, Parmesan, breadcrumbs, egg, 1 teaspoon coarse salt, and 1/2 teaspoon pepper until combined. Add beef; mix gently until combined. With moistened hands, form beef mixture into 16 balls (each equal to 2 level tablespoons). Place on a rimmed baking sheet, and broil until lightly browned, 10 to 12 minutes. Bring a large pot of salted water to a boil. Heat oil in a large saucepan over medium. Add carrot, remaining 3/4 cup onion, and remaining 2 teaspoons Italian seasoning; season with salt and pepper. Cook until vegetables are tender, 3 to 4 minutes. Add crushed tomatoes and tomato sauce; bring to a boil. Reduce to a simmer, and add meatballs. Cook, stirring occasionally, until sauce has thickened, 20 to 25 minutes. Ten minutes before meatballs are cooked, add pasta to boiling water; cook until al dente, according to package instructions. Drain and return to pot. 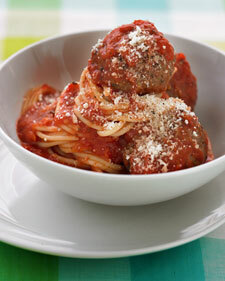 Add meatballs and tomato sauce to pasta; toss to combine. Serve, with additional Parmesan if desired.